The 2017 Mercedes-AMG C63 S Coupe was met with rave reviews upon its release. It has a great balance of sport and comfort which makes it easy to admire. You immediately notice its power and intelligence from the moment you step into the vehicle. The 449-hp biturbo V8 of the S550 4MATIC combines quick response with the efficiency of ECO Start/Stop. The C63 is also equipped with the 7-speed AMG SPEEDSHIFT MCT transmission technology which delivers instant response to any driving situation. The interior is wrapped in leather or covered in wood for a luxurious feel. 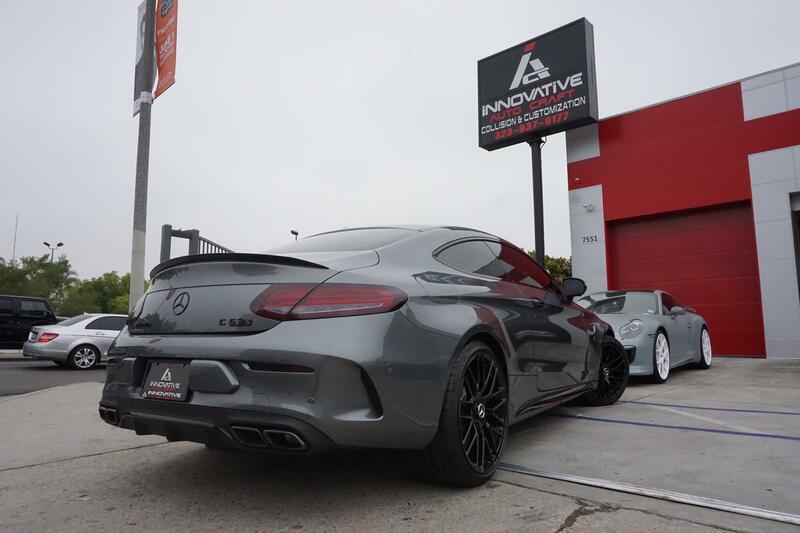 Innovative Auto Craft’s job was to make this vehicle look just as good on the outside; with blacked out trim, window tints, gloss black powder coated wheels and tinted tail lights. These additions enhanced the coupe’s unique design and enhanced existing features. Our team was excited to be part of the customization and we look forward to working on your next vehicle!